Just hours after he had declared his intention to continue as prime minister, Borissov told the Bulgarian Parliament that he was stepping down and that the government as a whole would resign by lunchtime. “The people gave us the power, today we return it to them,” he told the assembly. Borissov said he had no intention of participating in a caretaker government. “Yesterday we did a maximum to satisfy the demands of the protestors. From now on there is nothing we can do to help them,” he said. Protests against high electricity bills began last weekend and grew in the days since, with TV coverage showing chaotic scenes. Several demonstrators were reportedly arrested. Borissov sought to defuse the tension by announcing at a press conference at midday on Tuesday that the Czech utility ?EZ, which controls power distribution in Western Bulgaria, would be stripped of its license. Bulgaria’s power distribution market is divided into three regions, controlled by Czech firms ?EZ and Energo-Pro and Austria's EVN [see map]. Borissov also said that the price of electricity would be reduced by 8% from 1 March. Normally the power regulator is sets the price of electricity. The European Commission has recommended that the regulator in Bulgaria should be fully independent. 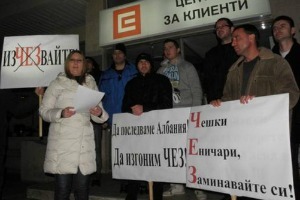 The statements by Borissov failed to defuse the tensions and demonstrators began calling for his resignation. Many carried banners calling Borissov a mafia boss and burned his portrait. Several people were wounded in clashes with the police. Bulgarians blame Borissov for the decline of standards of democracy and media freedom since he took office in 2009, and for his inability to tackle corruption. In a recent debate in the European Parliament, Bulgaria was described as “the weak link” in democratic standards and a threat to European values across the continent. In Prague, Czech Prime Minister Petr Ne?as said in a statement that he expected Bulgaria to keep its international obligations as well as the investment protection agreement in its dispute with ?EZ. The problem of high prices of electricity in Bulgaria is politicised and statements by Bulgarian representatives regarding ?EZ are "non-standard," Ne?as said, quoted by the ?TK news agency. "I expect Bulgaria as a member of the European Union to keep international obligations, the European law as well as its own laws, including those regarding foreign investment protection," Ne?as said. Industry and Trade Minister Martin Kuba said he intended to discuss the situation in the European Commission. The Czech minister called Bulgaria's conduct unprecedented. A Bulgarian prosecutor said ?EZ was a “systemic violator” of its contract with the Bulgarian authorities, citing among other things that the utility had assigned its procurement to its own subsidiaries, Dnevnik, the EURACTIV partner in Bulgaria, reported. The Bulgarian energy and water regulator DKEVR has opened a procedure for withdrawing the license of ?EZ, based on 17 irregularities, it was announced. Economy and Energy Minister Delyan Dobrev said he could not comment if ?EZ would lose its license, saying it was the responsibility of the regulator. “If the [regulator] decides to do so – this is a process which requires more than one single step, it is a process which begins with a notification, and ?EZ will have time to respond,” Dobrev said. Marlene Holzner, spokeswoman for Energy Commissioner Günther Oettinger said that the Commission, said was “a little bit early” to react to the threats against the Czech utility. “It is the responsibility of the member state and the regulator to give a license and to withdraw a license,” Holzner said. The country privatised its energy distribution network during the government of former Prime Minister Simeon Saxe Cobourg-Gotha (2001-2005). On 24 January, the European Commission referred Bulgaria to the European Court of Justice for failing to fully transpose the EU energy market rules. Dnevnik, the EURACTIV partner in Bulgaria: ??????? ??? ? ???????? ???????? ?, ?????? ???????? ?? ????????????????? ??????????? Dnevnik, the EURACTIV partner in Bulgaria: ??????? ??????? ???????? ???????? ? ??? ? ???????? ?? ??????????? Dnevnik, the EURACTIV partner in Bulgaria: ?????????? ????? ?????????? ? ????????????? ?????????? ? ? ???????? Dnevnik, the EURACTIV partner in Bulgaria: ????? ????? ????????? ?? ?????????? ?? ??????? ?? ?? ?